Made in response to a group project "local" with artists from Neat Studios, Bridewell Island, Bristol. 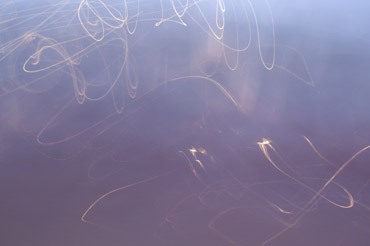 The images are taken by allowing my camera to take automatic exposures whilst flung over my shoulder, letting the camera see what it saw as I walked around the block at twilight (similar perhaps to the undifferentiated visual field of a new born baby being carried around?). The series title comes from the mathematical term used to denote the trajectory of fluctuations in stock market values or equally a or the path taken by a drunken man's unsteady lurch. The project is the first in a series of projects undertaken by the group. We are in the process of setting up a site to share our findings. The group is keen to explore the "irrational" of photography, to play with the medium in its many different guises and have fun working together. Our working group name is "The Approximates" (after our project, "Approximately 4 minutes walk").